This is a book that reminds you that the ordinary is extraordinary, that small lives are the same size as any other life and that tragedy and comedy are very close relatives. 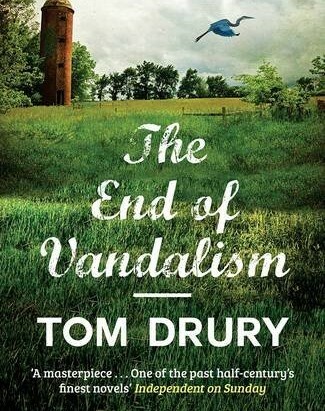 The End of Vandalism is a novel about ordinary people doing ordinary things – what marks it out is not its subject but its style, which is stunning. This is the everyday not as soap opera but as Breughel. The church June had directed him to was bunkerlike and modern, with a giant cross that seemed to challenge rather than court the stars. The character we observe here is Tiny, a thief and loser, who, seeing a vacuum cleaner standing in the church aisle, vacuums the carpet and then steals a silver pitcher. We understand all of Drury’s characters through their quietly-expressed, odd yet totally believable actions. That Drury was a small-town journalist explains a lot. The End of Vandalismis a patchwork of the sort of stories that you typically find in a local newspaper anywhere in the world: businesses closing, school plays, splashes of graffiti. If the book has a weakness it is a certain lack of harmony and narrative arc. It’s filled with a lot of characters, and in the first few pages it feels like a few too many, though a testament to the book’s mastery is by the end you know them all and care for them all, too. Next Writing groups – good company, but do they help you write?